I wanted to create an atmosphere of tranquility in a lighted night. To highlight the character, I made some lightning spirals and I use a zomm effect on the center. Because I found the colors a bit sad, I had some colors more "happy" and lightened the sea. Some sparklings and lights for the sky add to night effect. I choose the title when I added the light on Shigure's hands. Thanks to phamthua for her advices. Very pretty and cool as well! I really like the sky with all the sparkles. Love the colors. The effect around her is cool and the waves look nice. Wonderful Work! I really like the placement of all the elements in this wallpaper and the alternations between light and dark. Great job! The colors are so beautiful and the composistion so great! If this is only your 3rd wall, you've done an excellent job and I look forward to seeing more work from you. very neat for a third wall. i like the water effect. 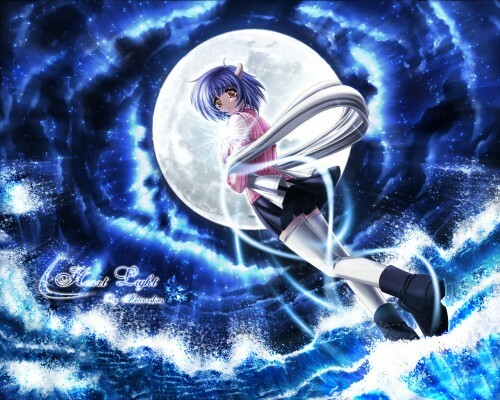 It looks like a tidal wave coming in on you as you watch the girl jump/fly to the moon. Very nice wallie the colours are very nice! The effects as well! Great work! Whoa...this looks really cool, Meteorskies; I saw it on someone's fav page and had to come check it out. I love the way the sky looks...so many different shades of blue and white! So yeah...nice job. pic very eye appealing! *^-^* BEATUTIFUL WORK OF ART! Wow, i like it when i look on this wawllpapers, I like the round ^_^ moon with the spiral effect, it so nice with the blue sea. And that girl is standing on the water? Such amazing effects you made! Keep it up! Its so AMAZING!